This clay pot dish is perfect for anyone who wants to try a different texture or variations of tofu. This dish suits most vegetarians who loves tofu and also perfect if you are an actual monk. 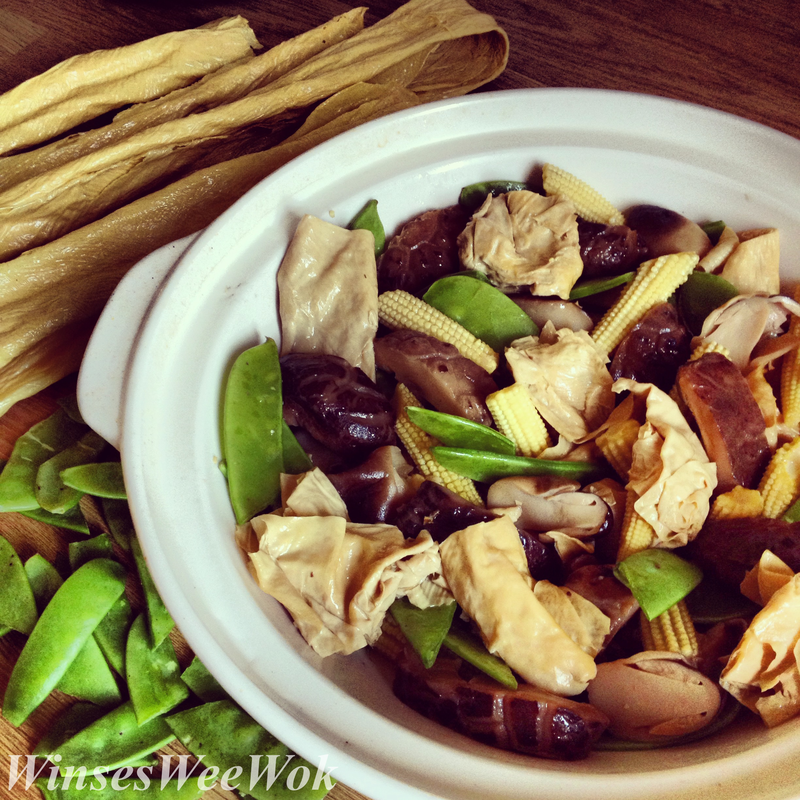 • Soak dried tofu sticks and Chinese mushrooms in boiling hot water for 20 minutes. Cover with a lid. Drain, cut tofu sticks into 2 inches length pieces. Remove stalks from mushrooms and cut into thick slices. Set aside. • Wash the rest of the vegetables under cold running water, drain, cut the baby sweet corn diagonally in halves and set aside. Trim the mange touts and cut diagonally in halves. Put into a separate bowl. • Heat a clay pot on medium/high settings. Add oil, once hot add the slice of ginger and fry for 10 seconds. Throw in all the vegetables except the mange tout. Add in all the mushrooms and the tofu stick pieces. Stir fry for 20 seconds. 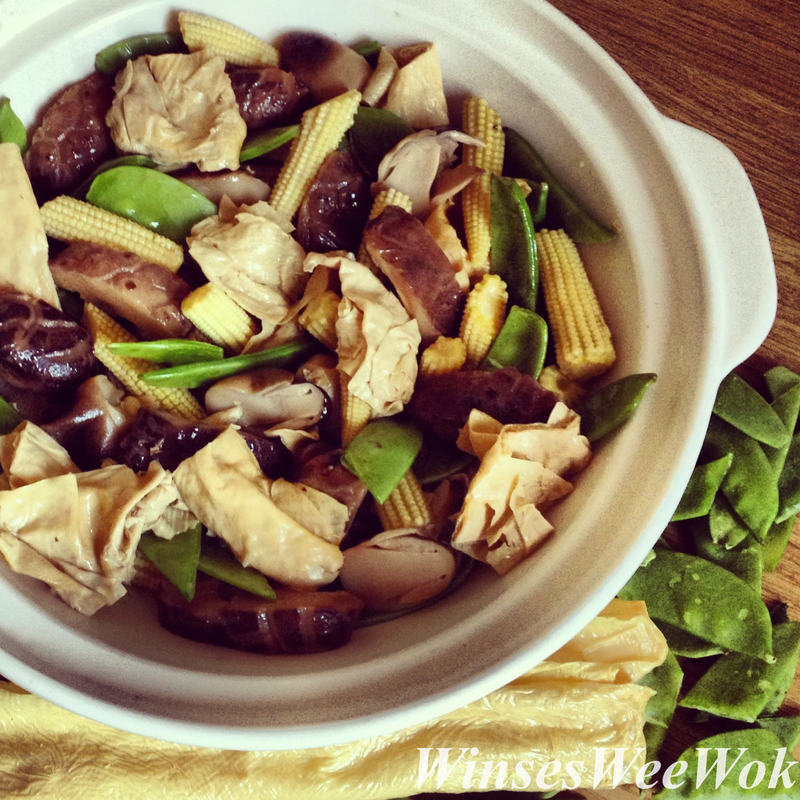 • Flavour with soy sauce, shaoxing wine, vegetable stock, sesame oil, salt and pepper. Reduce to a medium/low temperature. Lid on and simmer for 15 minutes. • Mix corn flour with cold water, add into clay pot. Throw in mange tout! Give it a mix, lid on and simmer for 2 more minutes. Serve.